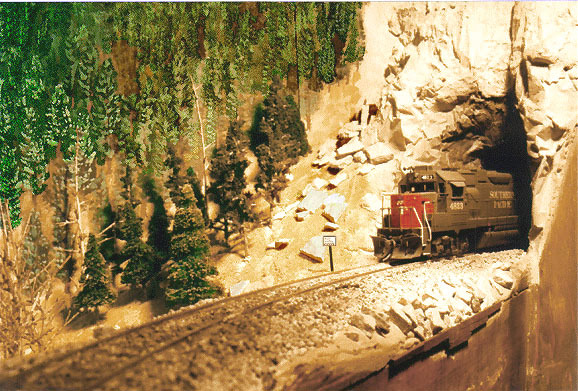 This being largely a mountain railroad, I’ve gotten a lot of practice casting rocks and building trees! The scenery base is either hardshell or styrofoam overlaid with plaster or Sculptamold. Rock faces are cast in place using molds made of crumpled foil (I highly recommend this technique!). A dominant scene is the Big 10 Loops section. This area is basically the edge of the High Plains, so it’s transitional from grasslands to a mountain environment. I still have a few finishing touches to complete. 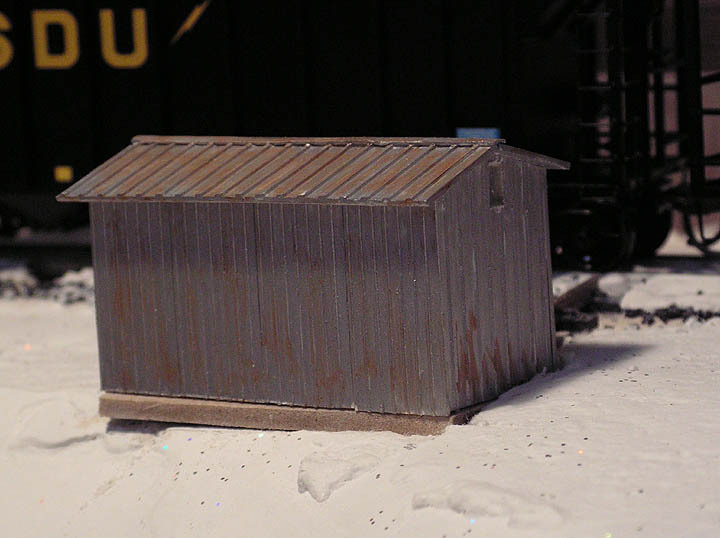 I built the hopper car windbreak by sacrificing some old McKean triple hoppers that I had on hand, spray-painting them tan. 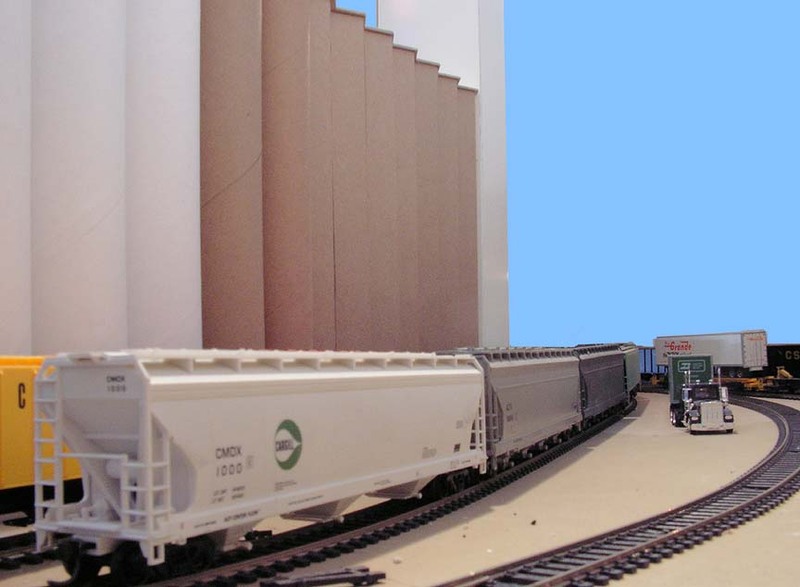 The real location has 23 cars– I have six– giving you an idea of how much compression is required when model railroading in a garage… This scene forms a large peninsula in the center of the layout. A look at the Big 10 area, as a loaded coal train drifts downgrade through Clay siding. Note the windbreak cars in the foreground. That’s a temporary digital backdrop of the real area. 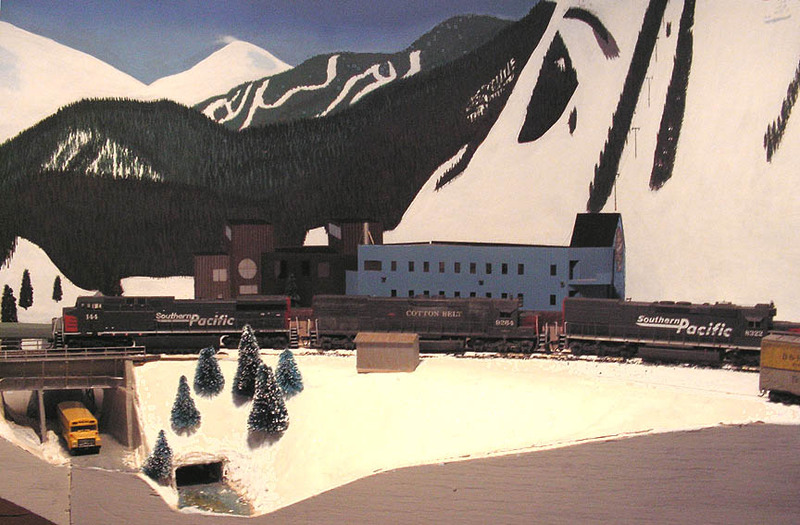 And here’s the actual backdrop, just completed as of May 2008. 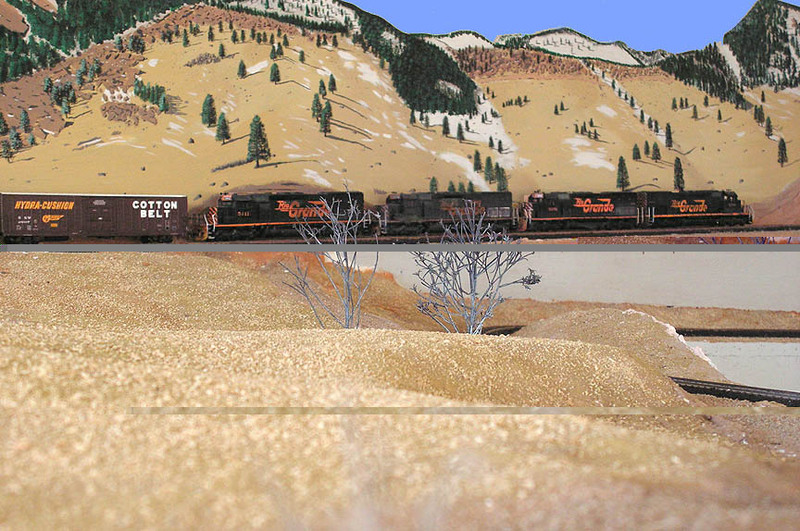 In this shot, a pair of SD45T-2’s and a Rio Grande SD40T-2 are heading past Clay siding along the base of the Front Range. I try to blend the foreground scenery and backdrops as carefully as I can, and with the right camera angle it looks fairly convincing. The rock outcroppings are the Ralston Buttes, essentially the southernmost of the rock formations known as the Flatirons which occur between here and Boulder. Another look in the same general area, with train 101 headed upgrade at Clay. The foreground scenery is the open ground in the middle of the Big Ten loop. You can see here the beginning of the transition between the lower and upper levels of the layout. This backdrop is eight feet long, made from Masonite hardboard, and took me about a week in my spare time to paint. See, it really doesn’t have to be a show-stopping project to create a respectable backdrop. I made it to be removable, since it backs a peninsula that juts into the room (a.k.a. garage). One thing I did differently here was to cut the backdrop to shape along the skyline, or horizon, with the sky on separate foam core board mounted behind. The sky is removable as well. This layered approach gives a nice feeling of depth. Here’s the east portal of Tunnel 2. In this view, rockwork is done and foliage is progressing. 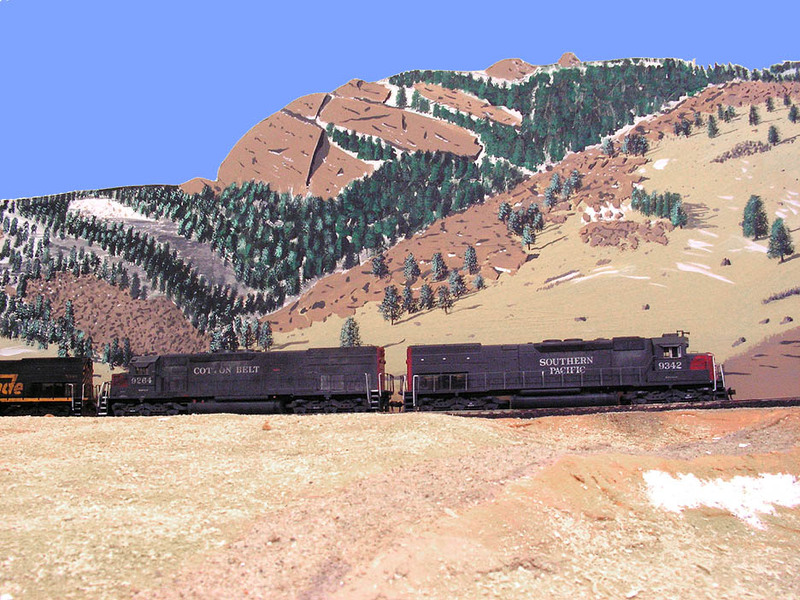 Later, backdrop scenery was painted above and below the track. The Big Ten landscape began with styrofoam sheets, followed by Sculptamold and plaster for the final landforms. I then painted it appropriate colors, and spread yellow grass and sawdust for ground cover. There is a scenery divider between Plainview and Pinecliffe. The eastern end is the Tunnel 2 scene, and the western side is the Tunnel 27 scene. Here’s Tunnel 27, the west portal. 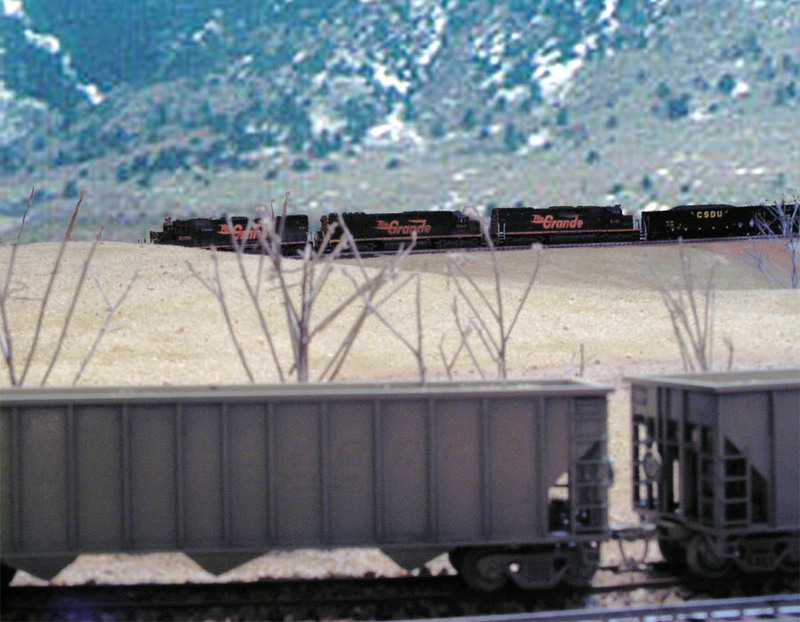 As the junction between new and “old” scenery, I had to blend the new foreground scenery into the existing backdrop. This scene is far up South Boulder Canyon, so the geology is much different than around Tunnel 2. Here’s the east portal of tunnel 30. It has more rockwork castings using the aluminum foil technique, a cast tunnel interior, and a detailed (and accurate) portal facing. 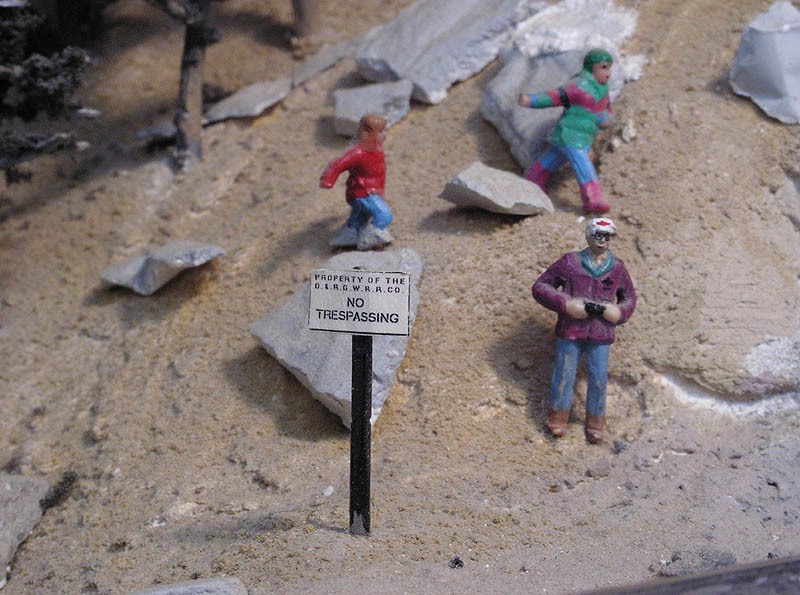 This style shows up on many tunnels in the Tunnel District. 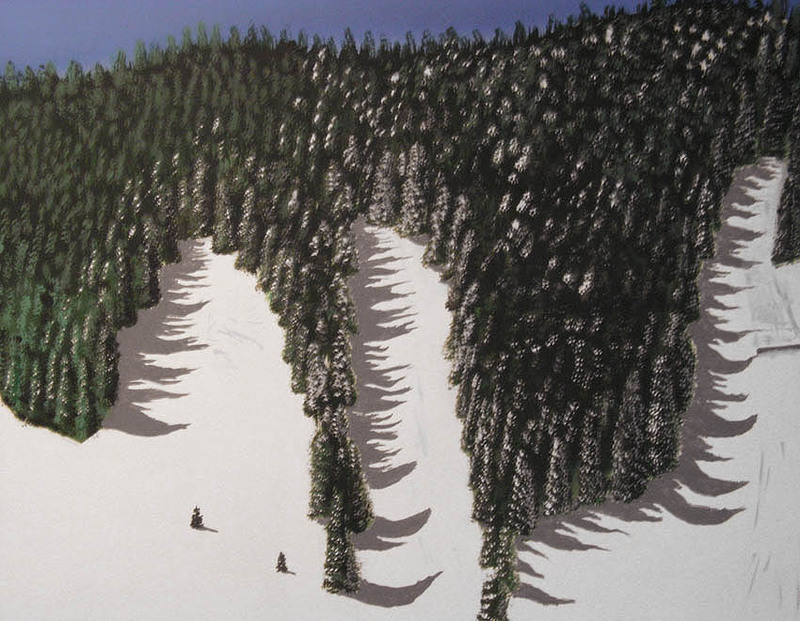 Many of the trees were created using my technique described below. Up in the higher elevations, the weather is a bit more severe. Snow is everywhere and the trees are abundant. Since I’m modeling the area in winter, there’s a lot of snow. I pour plaster in flowing shapes and paint white, sprinkling silver glitter into the wet paint (just a little). 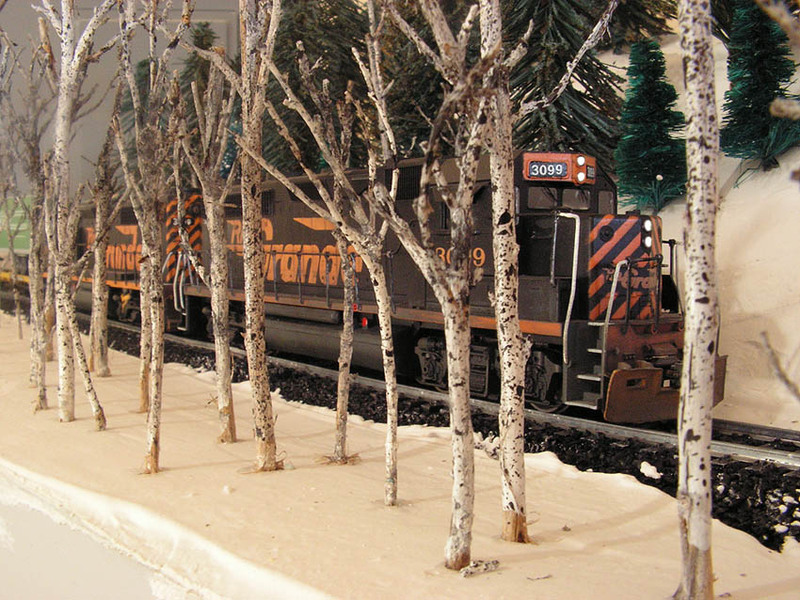 However, the lower reaches of the layout will be more typically bare, with just a little snow in the shady areas. 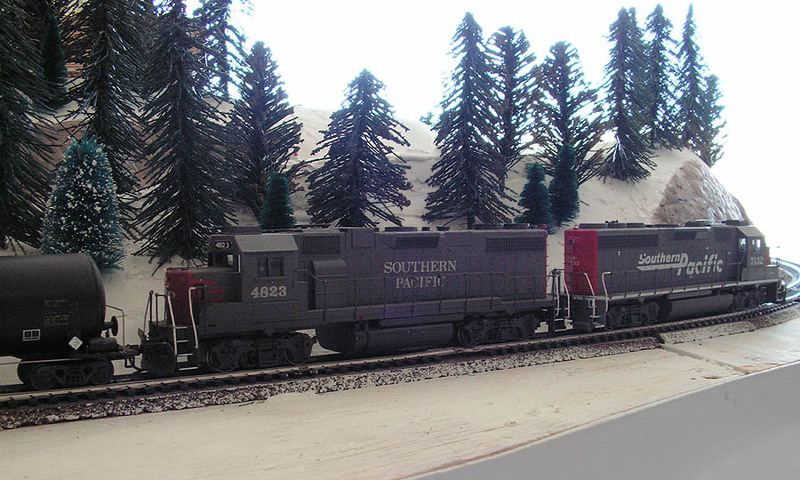 In the photo at left, a manifest train is westbound in the late afternoon at Hideaway Park, an area completely buried in snow. Vasquez Road is visible in the trees, as is the chapel. My daughter and I manufactured a lot of trees of various species– spruce, ponderosa, fir– by cutting up Christmas greenery. You need a lot of trees to fill a forest in Colorado. 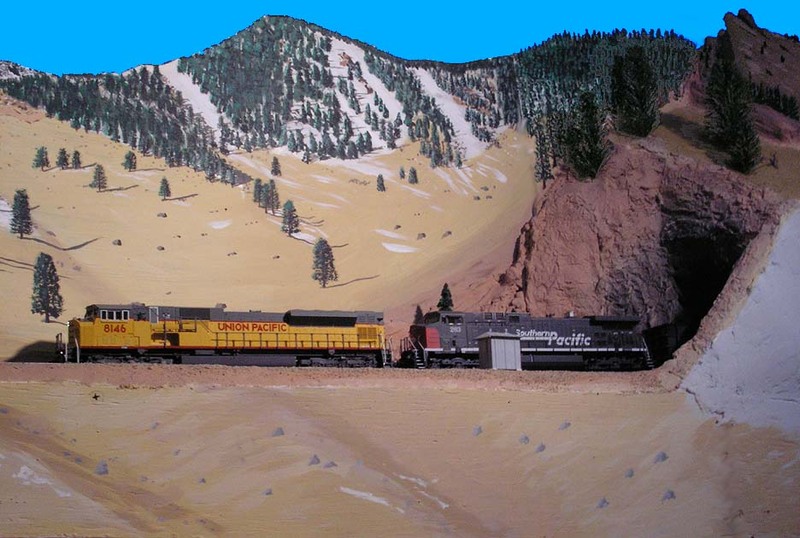 This photo shows the CSUX unit train rolling down the grade near Hideaway Park, with the partially-filled forest in the background. 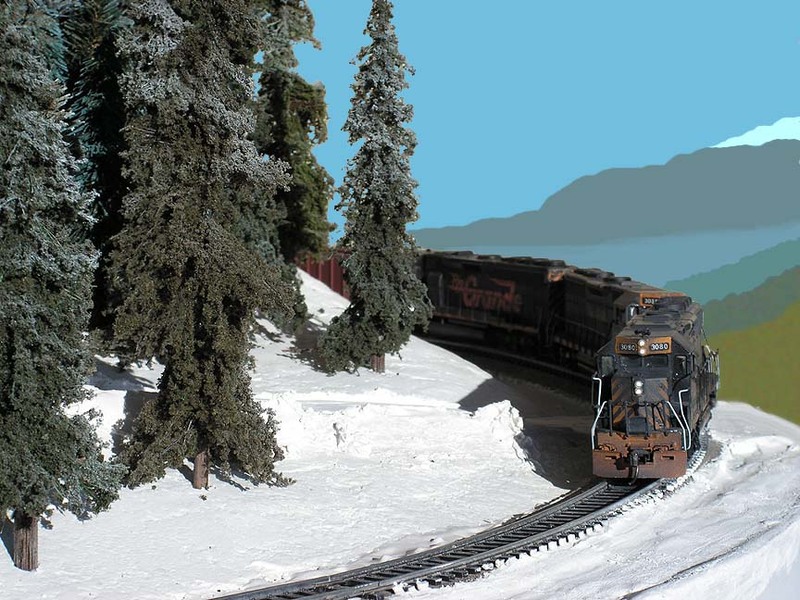 An eastbound freight climbs towards Hideaway Park on a bright winter day. This area is forested with some beautiful custom-made trees kindly given to me by a friend in Australia. I wish I had another dozen of them. There are a lot of aspens in the valley north of West Portal. Since it’s winter, the trees don’t have leaves, which I choose to view as a blessing. In this photo, a grove of aspens crowds against the right-of-way. I make the aspens from twigs of sagebrush, carefully selecting pieces and stripping off the bark. I then paint with white acrylic, splatter with dilute black, then seal with clear spray paint. Here are various structures and other scenic elements. Night scene of the service tracks at North Yard. 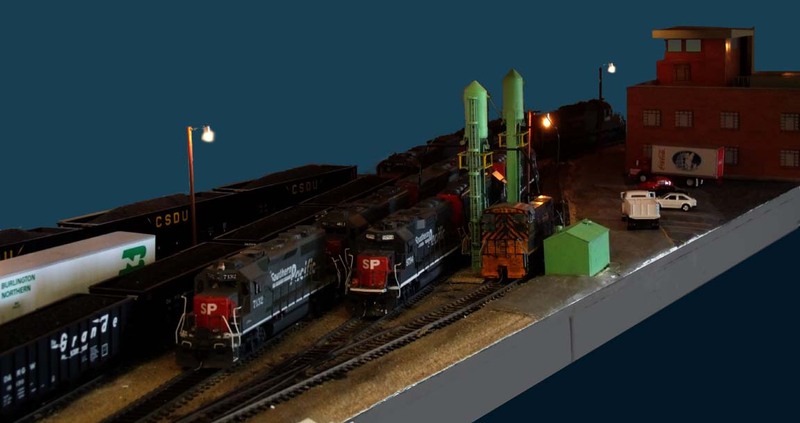 Featured are the scratch-built sand towers and the yard office building, all based on the prototype structures. Here’s an overview of the West Portal area. The bridge at West Portal has a trestle bent and handrails & supports all made from structural styrene. 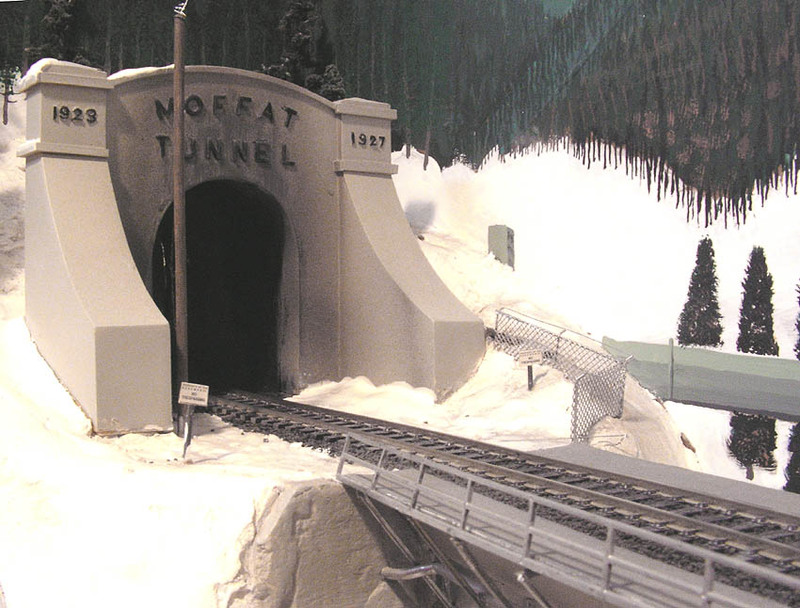 The tunnel portal was scratch-built from styrene and detailed, and the ski lodges were also scratch-built from structural styrene, using photographs to assist in design and proportions. I make free use of selective compression to fit structures into scenes. A closer look at the tunnel portal. I’m extremely proud of how this turned out, even though it’s not quite finished. One section of chain-link fence was damaged in the move, and I still need to replace it. Ditto the bridge handrails. I also need to install the plaques on the two wings of the portal. Other than that, it’s a pretty good representation of the scene circa 1990. 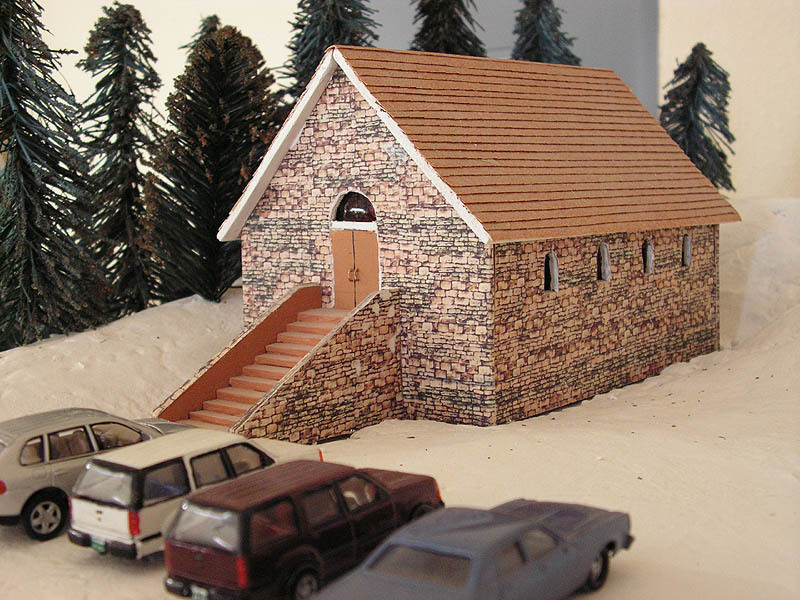 The chapel at Hideaway Park is basswood and 3/32″ plywood, with sandpaper shingles. It’s free-lanced; my wife and I built it together in about 1983. The far end has a massive stained-glass window. Note the two Ford Explorers. They were built from clear-styrene kits, and painted to match real Ford schemes. Even the license plates are hand-painted. 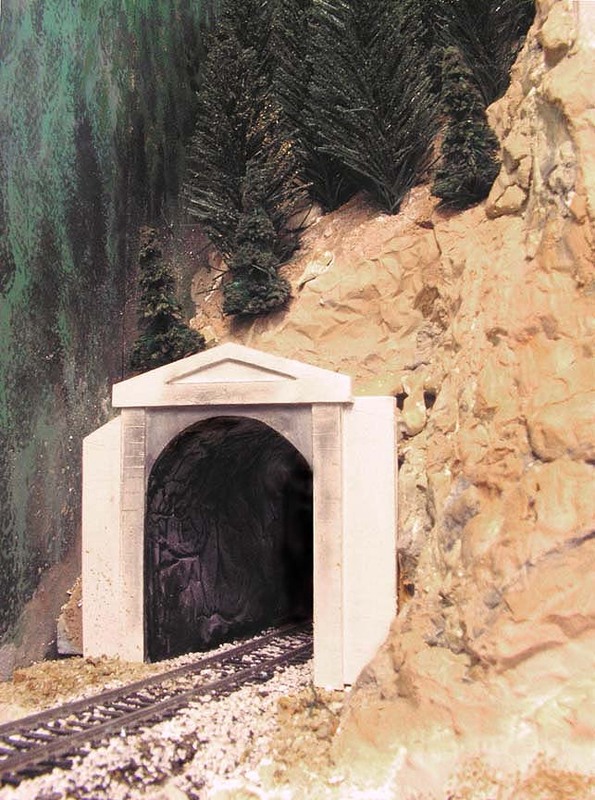 Here’s a section shed, built to scale from the real one at West Portal. I need to backfill a little drifting snow around the foundation. I’ve been working on beefing up the foreground scenery. 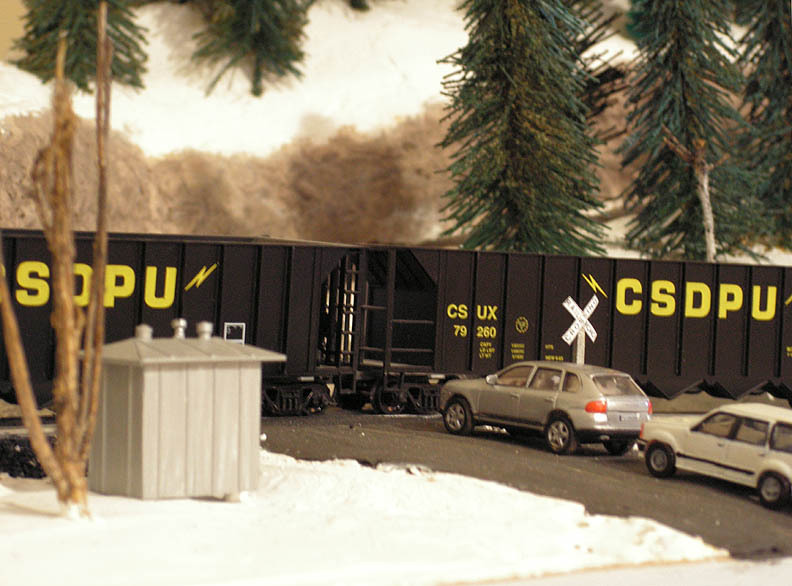 Here a signal shack (modeled after the real one) sits next to the grade crossing at Vasquez Road. The crossbuck is also new. Someday I’d like to replace it with a working flasher-and-gate unit. Signage brings a layout to life. Here’s a look at the unfinished grain elevator at North Yard, owned by Cargill. There are a couple of tracks that service the elevator. As you can see, scenery is not finished yet in this area. Still to come: the loading bay and machinery for the elevator (towards the far end of this photo), plus a number of other details, and of course, painting. Until recently this elevator was the largest structure on the layout. Nearing completion is my rendition of Denver Union Terminal (DUT), better known as Union Station. Here we see the Ski Train and the Rio Grande Zephyr spotted on track 2 and track one, respectively . The structure features nearly-scale length and scale height, plus an operating neon sign! Soon to come will be: completed roof, awnings, and platform coverings. Structural lighting is ongoing and looks great. Hideaway Park is nearing completion. Lacks one final condo, a few signs, and crossing lights. West Portal is about 4/5 complete. I still need to repair some damage that occurred during the move, and complete some details on the lodge. 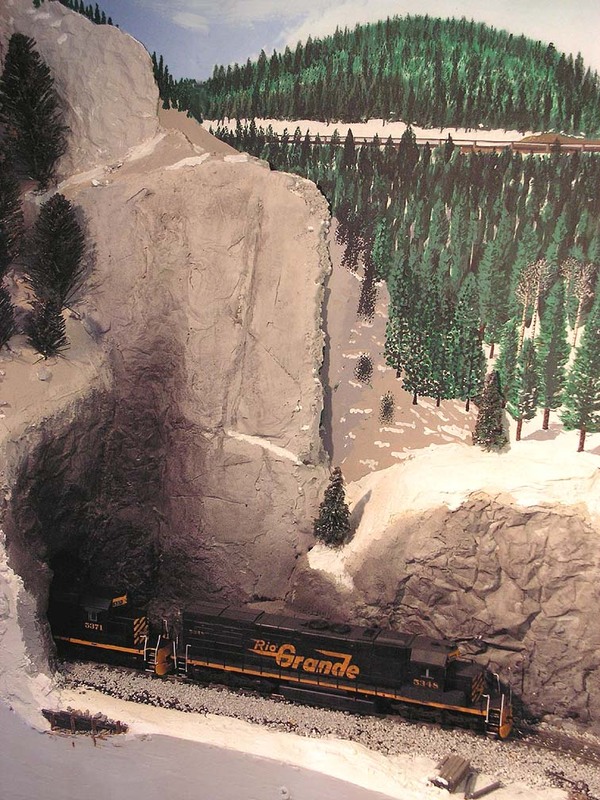 Recently I rebuilt and expanded the mountainside above the tunnel. The Cargill grain elevator is mostly complete. This dude is HUGE. Probably too big for my layout. Still needs the loading bay and the conveyor cover above. Union Station is IN PROGRESS! If you thought the grain elevator was huge, this structure dwarfs it. Fortunately I have the space in that location. Installing the passenger shelters will be a pretty big job, however. Complete the scenery at Rocky (Little 10).